The aim of a business is to always ensure that a customer enjoys a positive experience when dealing with their service or product. This is because customer experience plays a crucial role in customer satisfaction. 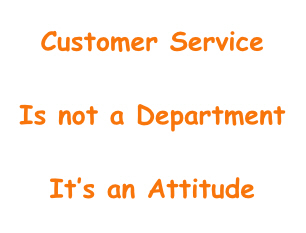 Customer satisfaction in turn plays a crucial role in customer retention and customer loyalty. In this day and age of cut throat competition and increasing homogeneity of products and services offered, the customer experience is what is most likely to set a business apart from its competitors. They care more about other people, including customers, They have more energy, They are happy, meaning they are more fun to talk to and interact with, They are more motivated on the other hand, when the company and management consistently side with customers instead of with employees, it sends a clear message that: Employees are not valued, That treating employees fairly is not important, That employees have no right to respect from customers, That employees have to put up with everything from customers. When this attitude prevails, employees stop caring about service. At that point, real good service is almost impossible – the best customers can hope for is fake good service. You know the kind I mean: corteous on the surface only. One woman who frequently flew on Southwest, was constantly disappointed with every aspect of the company’s operation. In fact, she became known as the “Pen Pal” because after every flight she wrote in with a complaint. She didn’t like the fact that the company didn’t assign seats; she didn’t like the absence of a first-class section; she didn’t like not having a meal in flight; she didn’t like Southwest’s boarding procedure; she didn’t like the flight attendants’ sporty uniforms and the casual atmosphere. Her last letter, reciting a litany of complaints, momentarily stumped Southwest’s customer relations people. Convince customers that they will get good service at this company, Convince employees to give customers good service, Fortunately more and more businesses are abandoning this maxim – ironically because it leads to bad customer service. Here are the top five reasons why “The customer is always right” is wrong". In conflicts between employees and unruly customers he would consistently side with his people. Here’s how he puts it: When we run into customers that we can’t reel back in, our loyalty is with our employees. They have to put up with this stuff every day. Just because you buy a ticket does not give you the right to abuse our employees. We run more than 3 million people through our books every month. One or two of those people are going to be unreasonable, demanding jerks. When it’s a choice between supporting your employees, who work with you every day and make your product what it is, or some irate jerk who demands a free ticket to Paris because you ran out of peanuts, whose side are you going to be on? You can’t treat your employees like serfs. You have to value them . . . If they think that you won’t support them when a customer is out of line, even the smallest problem can cause resentment. Great customer service involves more than fixing problems; it requires a sympathetic attitude that makes customers feel valued. Your voice and attentiveness speak volumes, especially when the phone's your only way to convey customer care. But for many younger workers, striking that sympathetic tone seems phony: "I resolve complaints fast... Do I really have to make nice, too?" This entertaining, research-based program helps young service providers understand that they're judged not just on their skills and intelligence but on how they ultimately make people feel. Attendees learn how to establish the kind of trust that can dramatically improve the customer's perception of the encounter. They'll also learn the importance of managing expectations and emotions so customers stay satisfied and loyal. Great customer service involves more than fixing problems; it requires a sympathetic attitude that makes customers feel valued. Your voice and attentiveness speak volumes, especially when the phone's your only way to convey customer care. But for many younger workers, striking that sympathetic tone seems phony: "I resolve complaints fast... Do I really have to make nice, too?" This entertaining, research-based program helps young service providers understand that they're judged not just on their skills and intelligence but on how they ultimately make people feel. Attendees learn how to establish the kind of trust that can dramatically improve the customer's perception of the encounter. They'll also learn the importance of managing expectations and emotions so customers stay satisfied and loyal.